An indoor potted amaryllis is a delight to see. 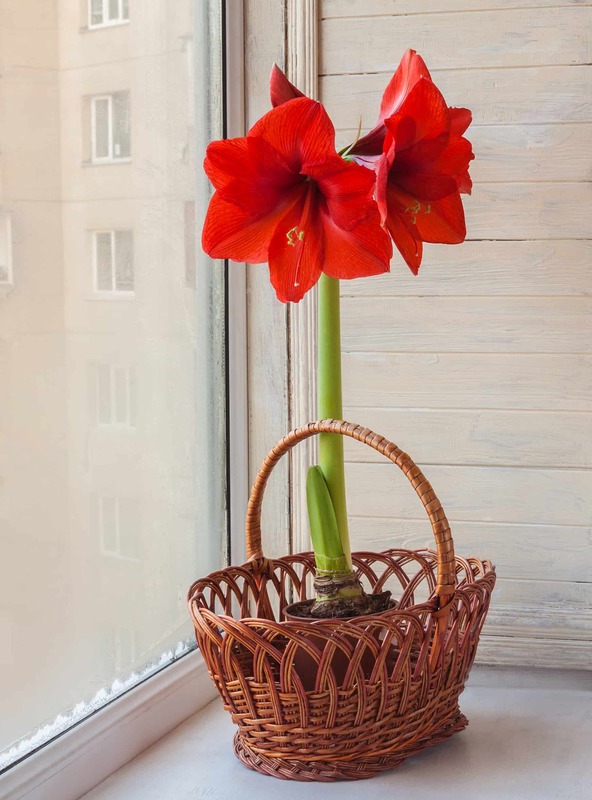 Often times when walking into a home, especially during and after the winter holidays, you will find a big beautiful red (or even white or pink) flowers sitting on top of long lanky stems from a bulb planted in a pretty pot. It’s more likely an amaryllis from the genus Hippeastrum, typically grown indoors and the bulbs are often given as gifts during Christmas. Its origins are in South America, native to tropical and subtropical regions from Argentina on up to Mexico and the Caribbean. William Herbert, a British botanist, gave it its name which means “Knight’s-star-lily” even though it is only a distant relative to the true lily, Lilium. Hippeastrum is referred to in its generic term as amaryllis. Even though it is categorized under the genus Amaryllis, it should not to be confused with the genus Amaryllis belladonna, a native flowering plant of South Africa also known as naked lady and Jersey lily. The large, colorful, showy flowers of Hippeastrum are wonderful and so easy to grow indoors. Most come in kits with the soil and bulb already planted in a pot. They start to bloom as early as November and produce two to four long-lasting flowers. ● The bulbs need to be in nutritious potting compost in order to give it the required nutrients to grow and bloom. Many pre-packaged amaryllis come with the soil and pot. You can also purchase pre-made compost at most plant stores. 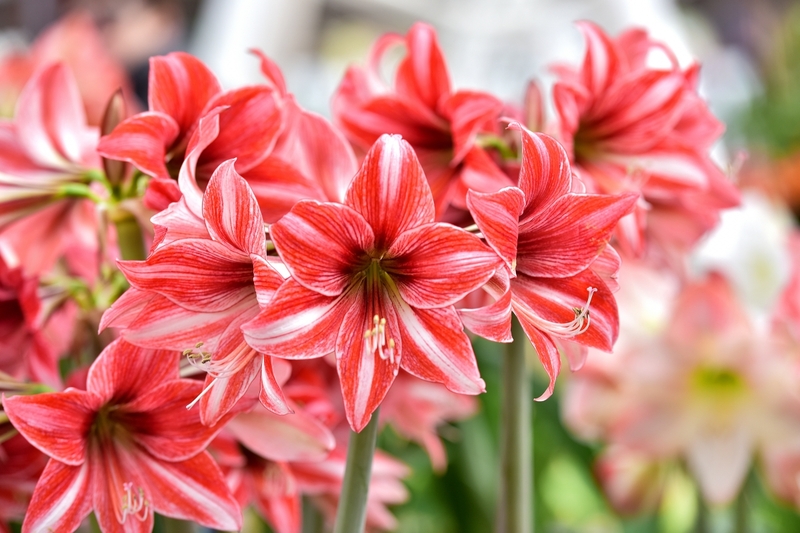 ● Once planted, to start the bulb and get stems to appear, water the amaryllis sparingly. Begin to water more as the plant’s stems start to grow, but do not water too much or the roots can drown. When it has flowered, water the amaryllis when the potting compost feels dry. ● Once the stems start to grow tall, be sure to give them support with a pole or stick if they begin to bend. Push the stick in gently so as not to injure the bulb. Attach with twine or flower rope at the top and bottom of stem. 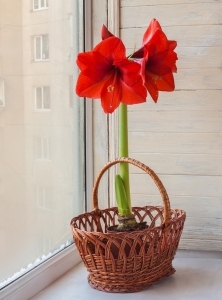 ● The amaryllis needs to be in room temperature and is why they do so well indoors during the winter. They can be placed outdoors still in their pots during the summer but cannot tolerate direct sunlight. ● The flowers bloom from late December to June, typically lasting 7 to 10 weeks, with larger bulbs producing larger flowers. 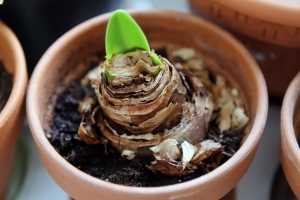 ● Once the amaryllis has stopped flowering, be sure to cut away the old flowers from the stem with a sharp knife or scissors to allow it to bloom again. And then when the stem starts to sag, cut it down to the bulb. The leaves will begin to yellow in early fall and need to be cut about 2” from the bulb. Pull up the bulb and place it in a cool dark place until it is time to plant it again.